How the brain cell works ~ Health Matters Today! University of Miami biology professor Akira Chiba is leading a multidisciplinary team to develop the first systematic survey of protein interactions within brain cells. The team is aiming to reconstruct genome-wide in situ protein-protein interaction networks (isPIN) within the neurons of a multicellular organism. Preliminary data were presented at the American Society for Cell Biology annual meeting, December 3 through 7, 2011, in Denver, Colorado. "This work brings us closer to understanding the mechanics of molecules that keep us functioning," says Chiba, principal investigator of this project. "Knowing how our cells work will improve medicine. Most importantly, we will gain a better understanding of what life is at the molecular level." Neurons are the cells that are mainly responsible for signaling in the brain. Like all other cells, each neuron produces millions of individual proteins that associate with one another and form a complex communication network. Until recently, observing these protein-protein interactions had not been possible due to technical difficulties. Individual proteins are small and typically less than 10 nm (nanometer) in diameter. Yet, this nano-scale distance was considered to be off-limits even with super-resolution microscopy. Now, Chiba and his collaborators have developed a novel methodology to examine interaction of individual proteins in the fruit fly – the model organism of choice for this project. The researchers are creating genetically engineered insects that are capable of expressing over 500 fluorescently-tagged assorted proteins, two at a time. 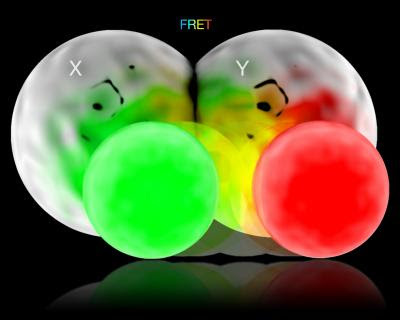 The fluorescent tags make it possible to visualize the exact spot where a given pair of proteins associates with each other. The team utilizes a custom- built 3D FLIM (fluorescent lifetime imaging microscopy) system to quantify this association event within the cells of a live animal. FLIM shows the location and time of such protein interaction, providing the data that allow creation of a point-by-point map of protein-protein interactions. The pilot phase of this multidisciplinary project is being funded by the National Institutes of Health. It employs advanced genetics, molecular imaging technology and high-performance computation, among other fields. "Collaborating fluorescent chemistry, laser optics and artificial intelligence, my team is working in the 'jungle' of the molecules of life within the living cells," Chiba says. "This is a new kind of ecology played out at the scale of nanometers—creating a sense of deja vu 80 years after the birth of modern ecology." At present, the researchers still need to extrapolate from data obtained in test tubes. In the future, they will begin to visualize directly how the individual proteins interact with one another in their 'native environment,' which are the cells in our body.